A granuloma is a distinct, compact microscopic structure formed by the aggregation of macrophages that are transformed into epithelium-like cells surrounded by a collar of mononuclear leukocytes, principally lymphocytes and occasionally plasma cells. Within seconds to minutes after exposure to antigen, resident cells initiate cellular recruitment. Prestored tumor necrosis factor released by mast cells recruits neutrophils, which in turn signal to and activate tissue and circulating monocytes. Interferon (IFN)-γ produced by natural killer and T cells further activates resident tissue histiocytes and macrophages. Macrophages produce interleukin (IL)-12 and present antigen to CD4+ T cells. Expansion of the population of Ag-specific TH1 cells. Perivascular T cell infiltrate is progressively replaced by macrophages. The genes of the five nicotinamide adinine dinucleotide phosphat ase hydrogenases (NADPH) oxidase components are CYBB (located on the X chromosome) encoding gp91phox, and the autosomal genes CYBA encoding p22phox, NCF1 encoding p47phox, NCF2 encoding p67phox, and NCF4 encoding p40phox. Approximately 70% of the patients with chronic granulomatous disease (CGD) have a mutation in CYBB (most of them hemizygous males, but a few heterozygous females with skewed expression of their mutation are also known). The remainder of the patients have a mutation in NCF1 (∼20%), CYBA (∼5%), or NCF2 (∼5%). Only one patient has been reported in detail with a mutation in NCF4. A loss-of-function mutation or a hypomorphic reduction-in-function mutation in any of these five genes can cause CGD. If the mutation leaves some residual NADPH oxidase activity intact, the clinical expression of the disease is attenuated and the chance of survival of the patient is higher than in case of total oxidase deficiency. This depends on the gene mutated, the type of mutation, and on the position of the mutation within the gene. In general, mutations in NCF1 lead to a milder form of CGD (later presentation, milder clinical expression, better chance of survival) than mutations in any of the other genes. Until recently, cellular investigations were necessary before adequate genetic analysis was possible. To make a choice of which gene to analyze, one needed to know the expression of the oxidase component proteins and the indications of a possible X-linked nature of the disease in the family. Nowadays, small gene panels, sequenced on benchtop next-generation sequencing platforms, are used, which can detect mutations in multiple genes in one run. Therefore, we now routinely analyze exons and exon–intron boundaries of all CGD genes, including the glucose-6-phosphate dehydrogenase (G6PD) and Rac2 genes., G6PD deficiency in severe form may lead to insufficient NADPH formation in leukocytes, thus hampering NADPH oxidase activity. Rac2 (Ras-related C3 botulinum toxin substrate 2) is a small gaunosine triphosphatases that is involved in the signal transduction from surface receptors to the NADPH oxidase, and when mutated may lead to CGD-like symptoms. If no mutations are found in any of these genes, it may be that the missplicing of the messenger ribonucleic acid (mRNA) occurs because of deep intronic mutations. Therefore, the mRNA size and sequence should be analyzed. Also for NCF1, it is sometimes necessary to analyze the mRNA because analysis of genomic deoxyribonucleic acid (DNA) is difficult owing to the presence of two pseudogenes very homologous to NCF1. 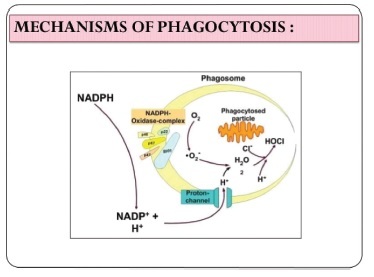 In the past few years, CGD has led to a new understanding of the importance of phagocyte oxygen metabolism for intra- and extracellular host defense and for the resolution of the concomitant inflammatory process. There is a new, strong, clinical and experimental evidence that the NADPH oxidase is critical for the downregulation of inflammation. Some oxygen metabolites generated by the activation of NADPH oxidase show direct cytotoxicity and antimicrobial properties. NADPH oxidase can also mediate intracellular host defense indirectly by the activation of microbicidal granule proteases in neutrophils as recently shown. The influx of electrons into phagosomes is compensated by cation fluxes across the phagosomal membrane to maintain electrogenic neutrality. The increased ionic strength leads to solubilization and activation of granule proteases (e.g., elastase and cathepsin G), bound to an anionic proteoglycan matrix stored in primary granules. In CGD neutrophils, the granule matrix is not resolved after fusion of granules with the phagosome. Neutrophils also release cytosolic and granule proteins as well as chromatin (DNA/histones), which mix to form neutrophil extracellular traps (NETs). These NETs bind and kill bacteria and target fungi. CGD neutrophils were reversed in one patient by gene theraphy, even though the neutrophils were deficient of NET. Current studies aim at understanding the relative contributions to antimicrobial host defense of each of the three reactive oxygen species-dependent killing mechanisms: NADPH oxidase-generated ROS versus protease activation versus NET formation. Cautious use of immunosuppressive therapy, namely corticosteroids, is required for acute granulomatous exacerbation in the lung, bowel, and urinary tract as well as for inflammatory bowel disease. Inflammatory complications are the most challenging symptoms in patients, as treatment with immunosuppressive agents might increase the risk of infection. Pro-inflammatory cytokines, such as IL-1B, targeted blockade may offer a focused treatment. Antimicrobial prophylaxis with immunosuppression as required remains the mandatory treatment. To date, hematopoietic stem cell transplantation remains the definitive curative treatment. Now results of multicenter study using a treosulfan stem are reported. Gene therapy by the modification of germ line DNA to correct mutated gene is a natural treatment progression from the replacement of defective recipient hematopoietic stem cell with donor cells. The last few years have seen tremendous advances in our knowledge of CGD. The provisional diagnosis of CGD should always be checked by a specialist, where a definitive diagnosis can be given by DNA-based molecular study. Isolated granulomas may be identified from a variety of infectious and noninfectious disease processes. The most common differential diagnosis include foreign body reactions, infections, Crohn’s disease, sarcoidosis, and orofacial granulomatosis because of the relatively nonspecific clinical findings associated with these granulomatous diseases. Thus, often an extensive clinical, microscopic, and laboratory evaluation may be required to identify the source of the granulomatous inflammation. Neville BW, Damm DD, Allen CM, Bouquot JE. Oral and Maxillofacial Pathology. 2nd ed. elsevier india: Saunders; 2002. Micheal C. Sneller granuloma formation, implication for the pathogenesis of vasculitis. Cleve Clin J Med 2002;69:sII40-3. Köker MY, Camcıoğlu Y, van Leeuwen K, Kılıç SŞ, Barlan I, Yılmaz M, et al. Clinical, functional, and genetic characterization of chronic granulomatous disease in 89 Turkish patients. J Allergy Clin Immunol 2013;132:1156-63.e5. Kuhns DB, Alvord WG, Heller T, Feld JJ, Pike KM, Marciano BE, et al. Residual NADPH oxidase and survival in chronic granulomatous disease. N Engl J Med 2010;363:2600-10. Roos D, de Boer M. Molecular diagnosis of chronic granulomatous disease. Clin Exp Immunol 2014;175:139-49. Greenberg MS, Michael G. Burkit’s Oral Medicine Diagnosis and Treatment. 10th ed. elsevier india: Harcourt; 2005.
van Bruggen R, Bautista JM, Petropoulou T, de Boer M, van Zwieten R, Gómez-Gallego F, et al. Deletion of leucine 61 in glucose-6-phosphate dehydrogenase leads to chronic nonspherocytic anemia, granulocyte dysfunction, and increased susceptibility to infections. Blood 2002;100:1026-30. Ambruso DR, Knall C, Abell AN, Panepinto J, Kurkchubasche A, Thurman G, et al. Human neutrophil immunodeficiency syndrome is associated with an inhibitory Rac2 mutation. Proc Natl Acad Sci u s a 2000;97:4654-9. Mandel L, Kaynar A. Sialadenopathy: A clinical herald of sarcoidosis: Report of two cases. J Oral Maxillofac Surg 1994;52:1208-10. Seger RA. Chronic granulomatous disease: Recent advances. Neth J Med 2010;68:334-40. Thomas PD, Hunninghake GW. Current concepts of the pathogenesis of sarcoidosis. Am Rev Respir Dis 1987;135: 747-60. Chisholm DM, Lyell A, Haroon TS, Mason DK, Beeley JA. Salivary glands function in sarcoidosis. Report of a case. Oral Surg Oral Med Oral Pathol 1971;31:766-71. James DG, Neville E, Siltzbach LE. A worldwide review of sarcoidosis. Ann NY Acad Sci 1976;278:321-333. Ghandour K, Issa M. Oral Crohn’s disease with late intestinal manifestations. Oral Surg Oral Med Oral Pathol 1991;72: 565-7. Plauth M, Jenss H, Meyle J. 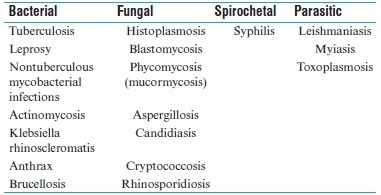 Oral manifestations of Crohn’s disease. An analysis of 79 cases. J Clin Gastroenterol 1991;13:29-37.